CEDARBURG, Wis. - When Tim Storey intuitively attains information about a deadly crime, he becomes obsessed with finding answers. 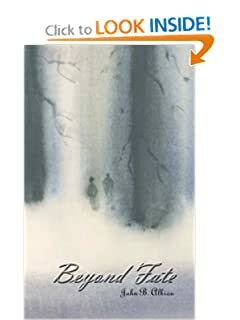 In the new novel, Beyond Fate (now available through 1stBooks), by John B. Albion, Tim, a teacher, follows his psychic abilities to solve a murder mystery. Set throughout the state of Wisconsin and the upper peninsula of Michigan, Beyond Fate deals with the mysterious disappearances of four people. A college girl never makes it home to Green Bay one night, but her car is found abandoned in a parking lot. A commercial fishing boat manned by a crew of three fails to make it back to port on a clear December day. Caught in the mix, Tim sees his solitary life as a junior high school teacher in Port Washington, Wis., turned upside down when his psychic abilities kick into high gear. He resides alone, turning over vague childhood memories of his lost parents. Suddenly, Tim begins to receive information that may be connected to the disappearances and the purpose of a strange antenna on the Clam Lake military base. Unsure if the intuitive clues refer to the girl or the fishing boat, he begins an investigation of both events that leads him to the upper peninsula and several shocking discoveries. Along the way, he encounters the enigmatic Palmer, a conspiracy theorist and paranormal investigator, who helps him solve the riddle. Tim also stumbles into a strange relationship with Petra, a young waitress at a local restaurant, who seems drawn to his newfound psychic ability. What they find exposes a truth deeper than fate. "Beyond Fate is the story of one man's redemption from his own dark past with all the threads that stitch a life together," Albion says. With a successful career in business, Albion, "the champion of change," has published leadership articles for The CEO Refresher and the Milwaukee Journal. The concept for Beyond Fate, his first novel, stems from personal experiences. Purchase Beyond Fate from Amazon.com. Beyond Fate - New Novel - Click here. The oldest and most successful print-on-demand and eBook publishing company of its kind, 1stBooks was founded in 1997 and has helped more than 13,000 people worldwide realize their dreams of becoming published authors. For more information, visit 1st Books. Did a UFO Crash in Siberia?